Close up of image 'lnwrmg2817' showing the approach to the station, the entrance to the goods yard and the remains of the cattle dock. The dark grey 'post' on the right by the points is in fact the ground frame which under the authority of the signal cabin controlled access to the goods yard. 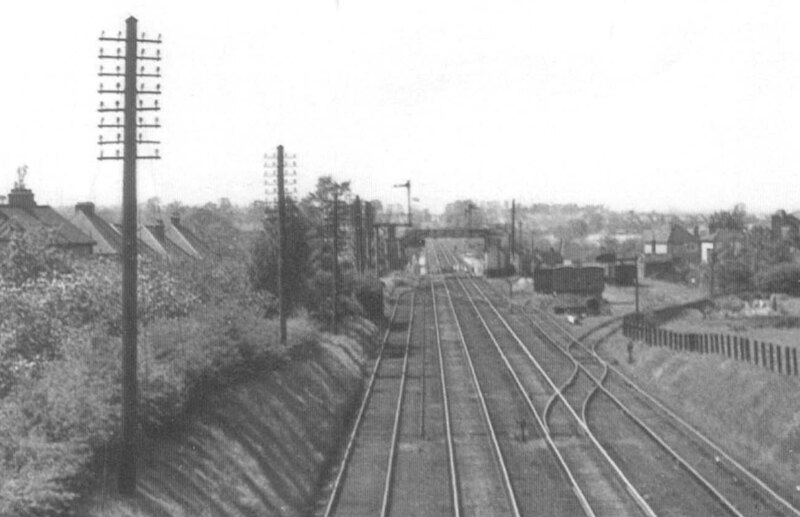 The ground frame itself was protected by a key retained at the signal cabin and because the loop line and shunting neck could only be accessed via points and signals directly controlled by the signal cabin. The siding on the right is protected by a loading gauge, a shaped piece of metal suspended from a cantilevered post, which ensured that any goods placed in an open wagon did foul structures along the line. Behind the cattle dock appear to be two raised huts similar in profile to a covered van. These would be used to store goods which needed protection from inclement weather.